I must have an addiction to repurposing sweater sleeves. It could be worse, I guess, but it is making me wonder. Remember my repurposed Sweater Sleeve Mittens? How about Repurposed Sweater Sleeve Gift Bags? Or the more recent Sweater Sleeve Travel Shoe Bag? Well, now I have a new sweater sleeve project to add to my portfolio and it all started when I saw this cute sweater at the thrift store. It’s purple so it caught my eye, of course. 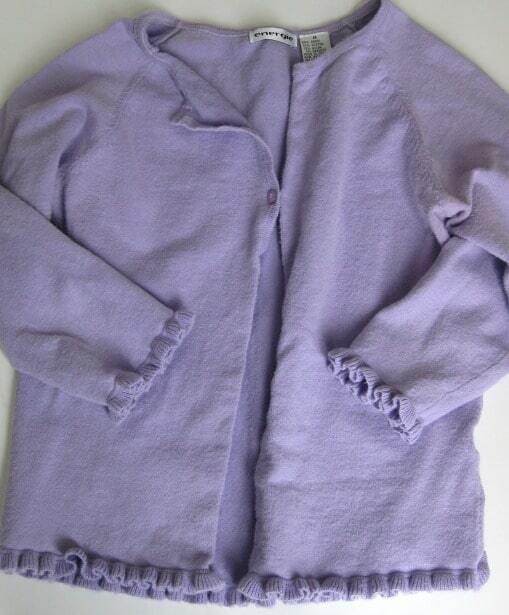 And I love the ruffle around the bottom and the sleeves. It doesn’t show in the picture but is has a stain and it was discounted. I have a hard time buying a sweater to cut up that could be worn by someone. But if the sweater makes it to the discount rack and has a stain, then I don’t feel badly at all taking it and giving it a new life. I brought it home, gave it a good washing (Mom), and cut the sleeves off. I’d been saving these yogurt cups for a while. Don’t know why, but I liked the size and shape of them. Then I simply slipped the yogurt cup inside the sleeve so the ruffle faced up. I tucked the cut side of the sleeve under and voila! 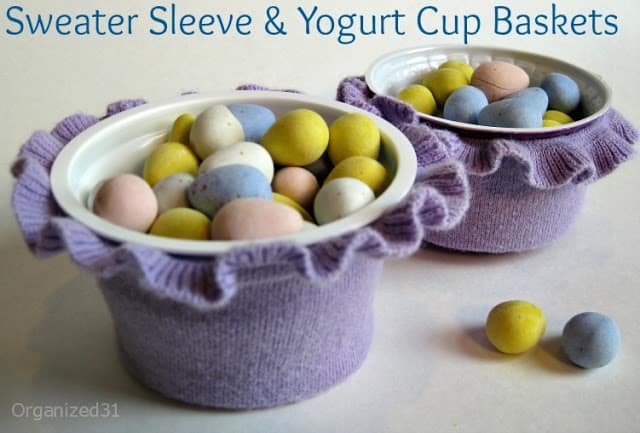 These would be adorable on your Easter table as treat cups or any time throughout the spring. Just find your favorite spring-y colors and have fun embellishing them. What a cute idea! Would be perfect for hosting a party for kids. Pinned! Visiting from 733 Link Party! I love your obsession with re-purposed sleeves – I gotta trust a gal with healthy obsessions!! How very cute! And who doesn’t also love those little chocolate eggs??! I love it! I wish I was a bit craftier. Sigh. What a cute idea! I love a good upcycle! I popped over from Tatertots & Jello– thanks for sharing! This is an amazing project! I write for Crafting a Green World and we do a Green Crafts Showcase every month to showcase awesome upcycling/recycling projects like this one! You should enter it if you’re interested! Adorable! I love it when something can be reused in such a great way! You are just so crafty! I love this idea! 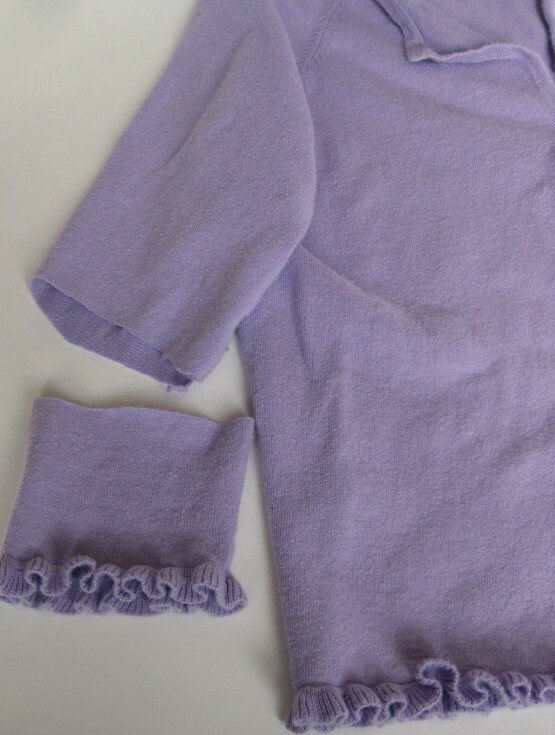 You were so lucky to find a sweater that is a lovely color and one that has those cute sleeves! love these cups and love the roses too! Thank you for linking them up at our linky party!